TAD has the remakes of the all time favorite 6L6 classics by RCA and GE. The TAD 6L6GC-STR is your perfect choice if you are up for the sound of the rock legends. It provides the low end with the right amount of pressure, as known from the famous RCA tubes. It has clear, transparent but unobstrusive highs and exactly the right bite to provide you with all those classic 6L6 sounds from big warm cleans to modern hard rock sounds. 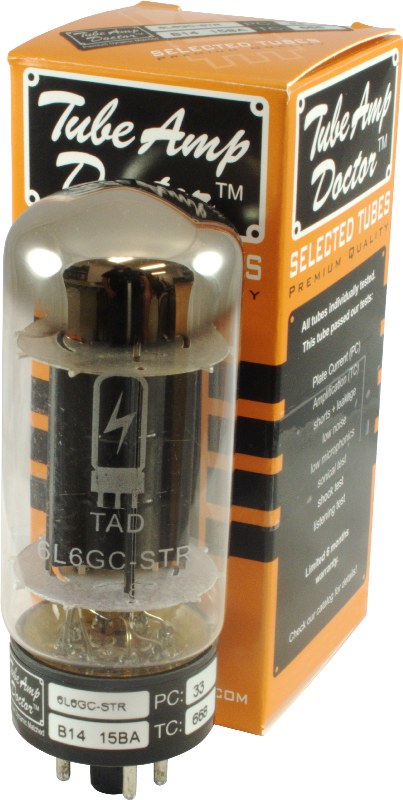 This TAD 6L6GC-STR combines the famous reliability of the american made Philips/Sylvania STR series (also known as MESA 6L6GC-STR415) with the black-plate system of the highly regarded vintage RCA 6L6GC tubes. Silky top end, combined with deep bass response and lots of headroom make this tube a living classic. Exclusive black-plate designs, gold gird wire, double getter construction, no-noise filaments and the 1.2mm thick heavy duty glass envelope. Matched Pair T-6L6GC-TAD-MP Packaging Dimensions 2 in. x 4 in. x 4.8 in. Matched Pair T-6L6GC-TAD-MP Weight 0.4 lbs. Matched Quad T-6L6GC-TAD-MQ Packaging Dimensions 2 in. x 8 in. x 4.6 in. Matched Quad T-6L6GC-TAD-MQ Weight 0.8 lbs. Single T-6L6GC-TAD Packaging Dimensions 2 in. x 2 in. x 4.6 in. Single T-6L6GC-TAD Weight 0.2 lbs. Great sounding, functioning 6L6GC-STR reproduction...Although those were never "RCA" tubes, they were made by Sylvania. RCA and many other brands were applied to those tubes, but all of the tall bottle 6L6GC-STR tubes,. of which this is a pretty god copy, were actually produced at the Sylvania plant. so end result i refuse to buy TAD products in the future as there tubes may be nice and they do sound nice in the amp considering the failure i can't afford to have this crap in my working amp as i travel as who knows when the next mechanical failure may occur! so thank you for your exception business and understanding as ni don't think its a reflection on you as a company but from now on its JJs or else but no way TAD... ps if i was in quality control for antique electronics i would cancel TAD's contract effective immediately as this is not the first or last time you will hear of this issue! TAD 6L6GC-STR. These came as OEM in my new Richter RS-33 tweed Bassman inspired combo. As an old (literally) 6L6 user, these are among the nicest sounding tubes I've ever used, and at the top of those currently produced. I wound up using these new ones as spares or replacement (should I out live my current OEM's from Sara), and I was able to continue using my current set, also from Richter, and from you as her OEM supplier, by purchasing your handy key inserts. The buying experience was top-notch as well. Thank you! Received the tubes in perfect condition. They were replacing Silvertone/RCA Black plates so had quite the shoes to fill......perfect. Thank you! The new tubes make my 37 year old amp sing. The order was placed, processed and delivered with no hassle at all. I will definitely be a return customer. Asked by Anonymous on September 25th, 2016. Yes, the G in 6L6G designates that the tube is glass. The 5881/6L6WGC is variation of this glass tube. Asked by artdonna84@msn.com on October 12th, 2018.